Hey, the Sonics are back at the Coliseum, and while it's preseason, it's still somewhat interesting to see two of the better teams in the West go at it. Of course, the big story is no Amare. How many wins will the Suns get this year without the big fella? Bob Weiss says there's no way they win 60 without him, and, of course, I agree. You can talk about the Canadian all you want, but Amare is and was the man for Phoenix, and with him in street clothes this team is in big trouble. 1. Radman is expected to play. 2. The Potato is out again, and may miss the entire pre-season. I don't know what he did to piss the Basketball Gods off, but it must have been something big. 3. Swifty and Frenchy will get a good run again, as Mikki Moore will probably sit. Let's hope they can show some improvement over game one. No tv, naturally, but the game is on KJR at 7:30. And, yes, I know the Sonics no longer play in the Coliseum, but, frankly, I'm sick of this corporate naming crap. Just because that bank coughed up some cash I have to change what I call the building the Sonics play in? No, sir, as an American I have every right to be an idiot, and if choosing to ignore what The Man tells me to say is what I want to do, then, by gum, I will ignore The Man. So, henceforth, the Sonics play in the Coliseum, the Celtics play in the Garden, and I am more than halfway to becoming an official old coot. I will be there tonight in my new Nick Collison Kansas Jayhawks jersey. Drinks in the Digorno club at halftime. Ask for Luis, he will hook you up! The Times is suggesting we may eat Brunson's contract to keep Alex Scales. Comments? It would, in my honest opinion, be a stupid idea to eat Rick Brunson's contract. Hell, I'm still somewhat irritated by the whole "Ibo" debacle. Anyway, although Alex Scales has done relatively well in training camp, it would seem very, very illogical to rid of a solid professional and veteran player such as Brunson. Besides, Scales is similar to the likes of James Cotton, Moochie Norris, Fred Vinson, Emanual Davis, Shammond Williams, Joseph Forte, Ronald Murray, David Young, et al. ; he can score, sure, but he isn't a point guard . . . or, for that matter, much of a defender. In addition, Noel Felix reminds me of Ansu Sesay; Felix is a guy who, defenisvely, can play masterfully at both forward positions. Yet, on the other hand, there is a lot to be desired regarding his offensive abilities—or lack thereof. In the end, ultimately, neither Scales nor Felix – as well as Roger Powell, who has yet to do anything worthwhile in either practice or games – should not, as far as I'm concerned, make the regular season roster. Anyhow, in related news, both Robert Swift and Johan Petro should begin the regular season as NBDLers down at Albuquerque, given that neither of them are seemingly ready to produce at a major league level. Similarly, due to the quality play of both Reggie Evans and Nick Collison so far throughout the pre-season, it appears that Danny Fortson will be regulated to earning nearly $6½ million via warming the bench. 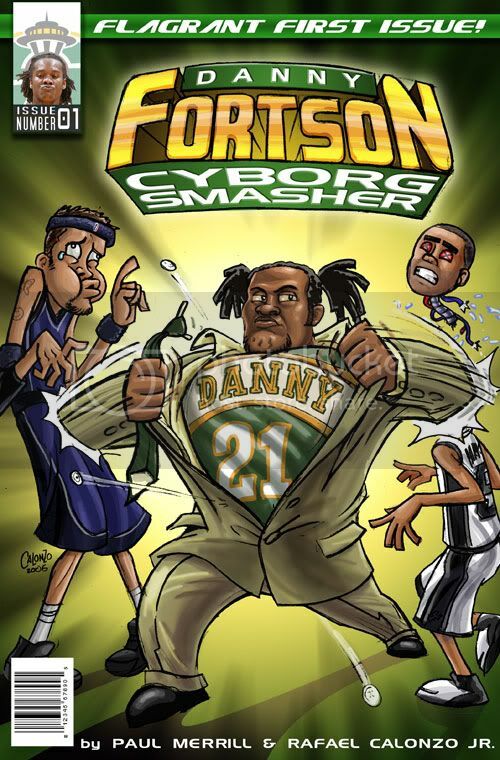 Ultimately, if Fortson and Rashard Lewis -- along with Robert "Stiff" Swift and the triad of useless foreigners (a.k.a., Peter Fehse, Mickaël Gelabale, and Paccelis Morlende) -- can be traded elsewhere for a true superstar (i.e., Paul Pierce), then Rick Sund needs to pull the trigger; Ray Allen deserves to have a quality running mate play alongside him. Remember folks, no matter what anyone else may claim, it takes two superstars to win a NBA championship . . . I know that's the prevailing wisdom, AK, but did the Pistons have any real superstars when they won the title 2 years ago? Ben Wallace might qualify, Rasheed is certainly a very good player, and Rip Hamilton can light it up, but are any of them superior to Rashard Lewis? If not them, what about the Hakeem Rockets; who else on that team qualified as a superstar? Other than Olajuwon, nobody on their first title team averaged more than 14 ppg (obviously, in year 2 Clyde Drexler would qualify). Or, how about the 2003 Spurs? Duncan was MVP-quality, but their 2nd best was probably Tony Parker. No, your argument has alot of support from the media, but it's not credible if you look at the facts. Rashard is as least as good as any of the 2nd-best players on those 3 teams, which means he's good enough for a title run. 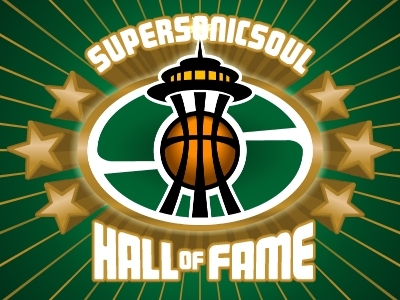 What those teams all had which the Sonics lack is a dominant inside force (Big Ben, Hakeem, Duncan). In my mind, that's what is keeping Seattle from a title, not Paul Pierce. Yeah, you're right, for it takes either one dominating post player (e.g., Hakeem Olajuwon) or two superstar swingmen (e.g., Michael Jordan & Scottie Pippen). With regards to the '04 Detroit Pistons, though, Rasheed Wallace was a superstar for that team, while Ben Wallace provided the dominating post presence on defense. Also, I shouldn't be too hard on Robert "The Stiff" Swift, but it looks more and more like he will end up being a complete and utter waste of a lottery pick. Besides, unlike "The Stiff," Al Jefferson had one hell of a rookie campaign in Boston last season. Anyhow, in regards to shooting guard Ray Allen and small forward Rashard Lewis, it concerns me that the two top players on the team are defensively unsound. Hell, the only position that has solid play on the defensive end is power forward, for neither center Vitaly Potapenko nor point guard Luke Ridnour are average, much less top-notch, defenders. As it is, those above reasons are part of why I'm upset that Rick Sund signed Potapenko to a two-year, $6,315,000 deal; the money he'll earn in 2006-2007 could've been spent during the next off-season on a defensive stalwart in the post—such as Joel Przybilla. Big men take time to develop, and while an Al Jefferson, Nick Collison, Rashard Lewis front line would look really good right now, Swift has time to mature. He can block shots already, and should have no problem rebounding. He's 19, he shouldn't be expected to be able to bang yet. But really man, how did we pass up Al Jefferson? Seriously? HE'S 19, and he's already good. ak1984: I think you're going to be pleasantly suprised with Gelabale in a year or 2. This guy has talent, and a pretty decent all around game. He's not as talented as Murray, and definitely not the scorer, but he has a nice all around game, playing good defense and can score without dribbling much. He can shoot (not sure about NBA 3 range) and can slash very nicely. Although he has a small frame, he is quite long and his defense would still be good. I think he could earn minutes on the Sonics right now, and if he progresses in the next couple of years in europe as he did in the second half of last year, he's going to be a valuable player for us in the future. I wouldn't right him off as useless yet. Now if he could be used to acquire someone the quality of Pierce, whether in a Lewis trade or otherwise, then obviously that's worth it. but i dont' want to give him away either. But back to Lewis, I like other posters here really thought he was the heart and the soul of the team last year. He really matured last year and shed his turtle in his shell act that used to drag him down in the past. I don't want to get rid of him. I think he works very well with Allen and gives us an inside presence that we wouldn't otherwise have.